This command-driven K-DOS is completely compatible with the Atari 2.0S and other related software. In addition, K-DOS supports the Atari 850 handler which allows the use of printers and modems. K-DOS features: a machine language monitor which allows examination and alteration of memory in hexadecimal and displays ATASCII representation; interception of the break instruction does not crash the system, but takes the user back into K-DOS; new, powerful commands reserve and erase memory and may be executed when the BASIC or Assembler cartridge is in control; K-DOS allows the user to create his own commands. 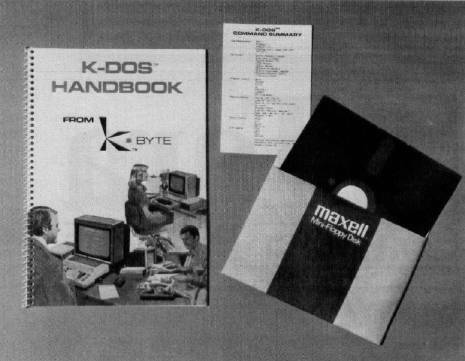 The 40-page, K-DOS instruction handbook, with disk attached, is easy-to-read and designed to acquaint programmers with all of the K-DOS features, and will give personal computer buffs greater reliability, flexibility and control. The handbook is divided into five individual sections for quick reference and also contains a pocket Command Summary Card.